Silicon,-(symbol: Si, group IV A, atomic number 14) derived from the Latin word silex (Flint) was isolated for the first time in 1823 by the Swedish chemist Jons Jakob Berzelius. It is a tetravalent element, (same as Carbon), with an electronic configuration [Ne]s23p2 Silicon is the main component of the earth's crust (~ 28%). In the nature it is found in oxides (SiO2) or silicates. 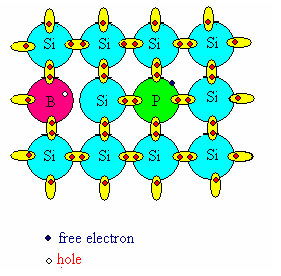 The main crystalline form of Silicon is the cubic one (c-Si). 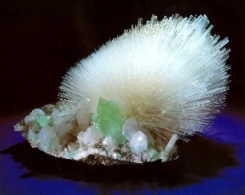 However, its oxide form, SiO2, can occur in a wide variety of polymorphs, among which a-quartz (space group P3221, Number 154) represents the most stable one. Main uses of oxides are as glasses, ceramics, and in the production of pottery and cements. Silicon so obtained is not pure and HCl is added to“wash” it; then, introducing H2, a catalytic deposition is performed passing through a trichlorosilane intermediate. The physical process of silicon purification is called zone melting or zone refining; this process is based on the fact that impurities contained in silicon have a melting point temperature that is lower than Si, and in this way, it is easy to remove them. The main feature of silicon is its semiconductor behavior, i.e. its resistivity is between that of metals and dielectrics. Differently from metals, Si (and similarly the other semiconductors) has an energy bandgap between the highest occupied electronic level (also VB, Valence Band) and the lowest unoccupied one (CB, Conduction Band). The reported experimental value is Eg ~ 1.1 eV at 298 K.
Adding small amounts of different atoms can improve the conductive properties of silicon. Indeed the presence of trivalent (B, Al, Ga) or pentavalent (P, As) atoms (p and n doping, respectively), formally corresponds to have an extra positive charge or an extra negative charge. The increased number of carriers thus improves the conductivity of silicon. 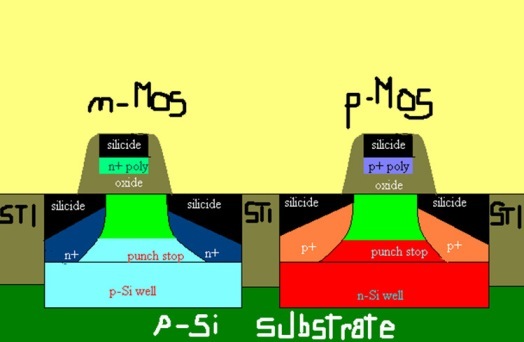 Interface of silicon with its own oxide, Si-SiO2, plays an important role in electronic devices and it can be engineered with a very high precision. The figure below shows the chemical bonding at the Si-SiO2 interface with the different orientation of crystalline silicon surface, (100), (110) and (111). Zeolites are compounds whose cage is mainly constituted by Si, Al, and O (hydrated aluminosilicates) with the excellent properties of ion exchange, adsorption, and catalysis. Zeolites are both synthetic (almost 150 already classified) and can occur naturally (about 40) as result of the mix between saline water and volcanic melts. For chemical applications, the synthesized ones are highly preferred for their degree of purity. Silicone (polymerized siloxanes with the common formula [R2SiO]n; R = CH3, C2H5 or C6H5) and Polysilsesquioxanes are both hybrids of organic/inorganic materials that have wide applications. The organic group is bound to Si via a Si-C bond, and the size and the properties of this organic group highly influence the overall properties of these polymeric materials in terms of porosity, thermal stability and other properties.